The prestigious Forbes magazine, on its Central American edition, interviewed Juan Ignacio Martínez, Excecutive President of Joya de Nicaragua, about the status and development of the tobacco industry in Nicaragua. We translated the article to share it with you all. Cigars, money made from smoke in Nicaragua. 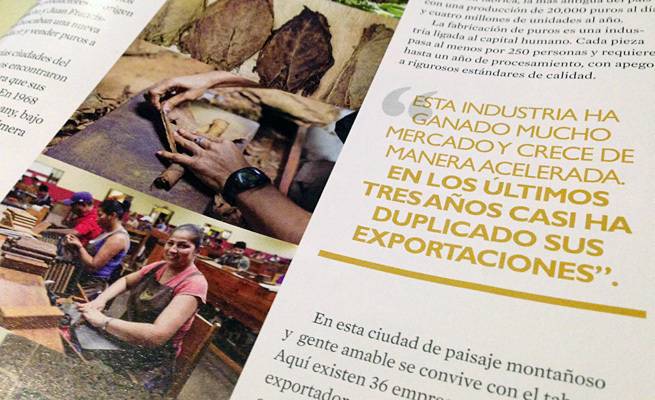 The new breath of the cigar industry has lead the sector to become 28% of the total nicaraguan exports. 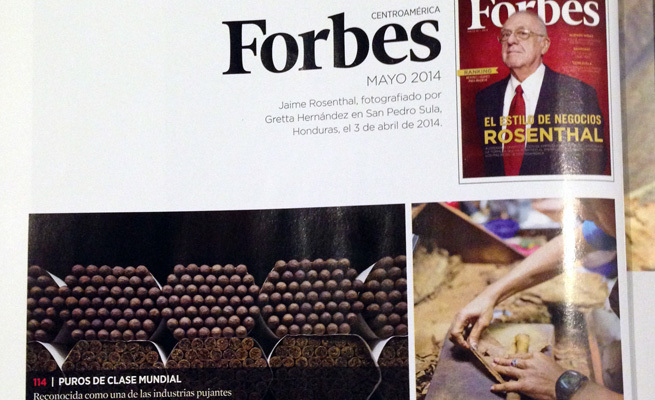 Nicaragua has been recognized for the 5th time as one of the top countries to produce cigars. According to Cigar Aficionados’s top 25 brands in 2013’s ranking, 11 of the winners were from nicaraguan origin. Estelí, located 91 miles from Managua (Nicaragua’s Capital city), is an agrcicultrual city whose main economical activity is based on world renown cigar manufacturing for export. Tobacco leafs arrived to Estelí at the beginning of the 60’s with cuban manufacturers Simón Camacho and Juan Francisco Bermejo, who were looking for an alternative to produce and sell cigars to the U.S..
After evaluating different cities in the country, the cuban businessmen found fertile soil and the best climate to develop their tobacco leafs. In 1968 they founded Nicaragua Cigar Company, under the Joya de Nicaragua name, the first cigar brand of the country. The cigar was able to quickly position itself in the U.S. market and captured the atenttion of the once President of Nicaragua, Anastasio Somoza, who entered the tobacco business at the end of the 70’s. After being defeated by the revolution, his belongings went to the Sandinista goverment, who continued producing cigars and selling to alternative markets, such as Russia, Germany and Czech Republic. During the 90’s, the company became property of the employees, who then looked for investors to increase production in the middle of a privatization process which ended in 1994, when businessman Alejandro Martínez Cuenca aquired the company. “In the middle of the 90’s the cigar boom phenomenon happened, and a lot of companies came to Estelí to start producing and exporting”, recounts Juan Ignacio Martínez, actual Excecutive President of Joya de Nicaragua. Martinez explains how the elaboration process is as complex as exciting, and details each component of the stages: from the cultivation to pre-industry and the manufacturing stage, currently being done in his factory, the oldest one in the country with a production rate of over 20,000 cigars per day and more than 4 million per year. The cigar industry is strongly linked to human capital. Each piece goes through at least 250 people and requires even a year of processing, with adherence to rigorous quality standards. In this city of highland landscapes and gentle people, tobacco is something you live with. 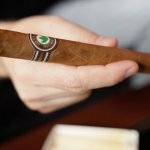 There are 36 companies producing and exporting cigars, 90% of which are from independant capital and generate 30,000 direct jobs and around 150,000 beneficiaries, according to the Nicaraguan Tobaco Association. “This industry has gained a lot of market share and is growing in an accelerated way”, states Luz Marina Arana, coordinator of the Market Research area at the Export and Investment Center (CEI). In the last year, the industry registers a 18% growth on exports of tobacco and cigars. The industry went from exporting 91,832.7 mmd in 2009 to 176,984.9 in 2013, according to figures from Banco Central de Nicaragua, having the U.S., Spain and Germany as main destinations. 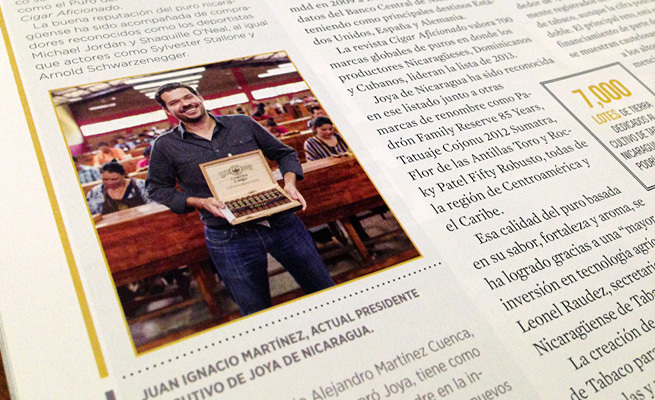 Cigar Aficionado magazine reviews 700 world-class cigar brands in which nicaraguan, dominican and cuban manufacturers lead the list for 2013. Joya de Nicaragua has been recognized on that list together with other renown brands such as Padrón family Reserve 85 Years, Tatuaje Cojonu 2012 Sumatra, Flor de las Antillas Toro and Rocky Patel Fifty Robusto, all from central american and caribbean region. Such quality, based on its flavour, strength and aroma, has been able to be reached “thanks to a bigger investment on agricultural technology”, ensures Leonel Raudez, secretary of the Nicaraguan Tobacco Association (ANT). The creation of an Experimental Tobacco center to generate more agricultural inputs to potentiate the quality in plantations, as well as a bigger bet from investors, these are subjects pending for tobacco producers. According to stats by the ANT, there are around 7,000 lots dedicated to tobacco that are duly registerd, although the number could be twice as much. The main challenge is in recieveing financing from the local banking system, who present themselves with caution due to the high production costs, mentions Raudez. In spite of this, producers aspire to keep on growing in the coming years. Currently, the sector represents 28% of Nicaragua’s total exports. Increasing the established markets and taking advantage of commercial agreements will allow the sector to keep growing, said Lus Marina Arana. Joya de Nicaragua aims to enter three to five new countries per year, establishing a country-brand, finilazes Juan Ignacio Martínez.